Dredge higher: What I like about Michael Savage and Ann Coulter is that they tell you what to think. You don’t have to do any of the work yourself. It’s like having a plumber come to your house to fix a clogged toilet. Once he takes over, everything’s flushing. Same with Savage and Coulter. It’s from Coulter and Savage that I learned to hate bureaucrats. Like the ones at the Jaxonpool Port Authority (JPA). They want to dredge a 47-foot ship channel in the 40-foot deep St. Johns River. They say the river needs 7 more feet to make Rio on the River a major port. The Army Corps of Engineers is only willing to dredge to 45-feet. All this will cost hundreds of millions. Are these people nuts? We don’t need to dredge. No sir! We can raise the river seven feet. The way to do it is obvious. Greenhouse gasses! Let me explain. First, let me make one thing clear. There’s no man-made global warming. That’s total hooey! Not that the planet isn’t heating up. It’s just that man has nothing to do with it. Why’s the earth heating up? The earth’s spun out of its orbit and is moving too close to the sun. That’s all. The Twilight Zone reported it. Spoiler alert! At the end of the episode, the main character wakes up and, GUESS WHAT! it was all a dream. Yes, the earth had spun out of its orbit, but it spun out the other way. Toward the planet formerly known as Pluto. Earth really was heading away from the sun. Everything was getting colder. Thank God we’re not experiencing that! Anyway, let me be clear about where I stand. I want to make my true position known. Al Gore should be waterboarded with glacial runoff. Still, he actually may be on to something. What if we really could hurl massive numbers of greenhouses into the atmosphere. Then their gasses would escape. They’ll seep right out. We just might be able to speed up the warming. Wouldn’t that be exciting? Maybe then we really could make the ice caps melt. And thereby raise the sea levels. Not too much, mind you. Just a little bit. Just a tad. A wee tincture. Say, 7 feet. Then we wouldn’t have to spend hundreds of millions of taxpayer dollars on a federal dredging boondoggle. With a deeper navigable shipping lane, our port could accommodate the Panamax ships due to arrive in 2015. Then our city could have class! Then we could be a contender! Then we could be somebody. Instead of bums. Which is what we are. According to the Times-Union article, “With a 45-foot channel, the economic activity would result in a total of 21,138 direct, indirect and induced jobs. At 47 feet, JaxPort’s activity would support 30,981 jobs.” Just two feet deeper, or higher, adds 9,843 jobs! So giving a little nudge to global warming may be worth it. Just a little push. Maybe we should add another 3 feet, so the channel would be 50 feet deep. That’d maybe add another 4,000, maybe 5,000 jobs. It’s worth it, don’t you think? Trouble is, we can’t overdo it. We can’t get ahead of ourselves. We can’t get greedy. We just need the oceans to rise seven feet—ten feet max. Any more than that, and there could be trouble. 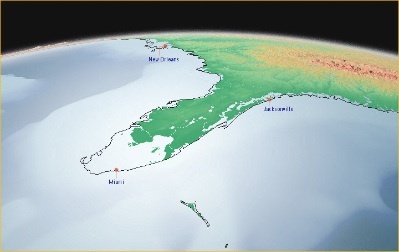 South Florida eliminated by sea-level rise. Haven’t I made my point? I have so many of them. And I’m going to keep making them. The point here is jobs. Jobs are what count. Jobs are the thing. Jobs are what we want. Jobs are all we need. Jobs! Jobs! Jobs! No matter how demeaning and low paying, we’ll take ’em. Why? Because we want to be SOMEBODY! The only problem with the equation above is that the everything that’s a “1” really ought to be a “0.” That’s because, as I said, no energy was wasted. Zero was expended. Not even the smallest nano-unit of mental energy. I just put my brain on auto pilot and, voilà, Savage and Coulter took over. It’s easier that way. Because once they’ve taken over and done what they do, all that remains is flushing.